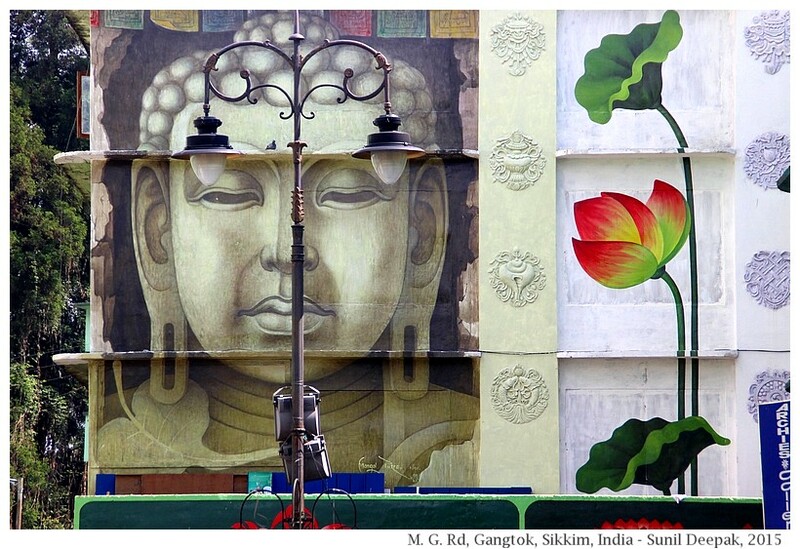 I was in Gangtok, the capital of Sikkim (India) only for 4 days. Apart from the short time, every day I had some work to do, some places to visit and some people to meet. So there was not much time to go out to visit the tourist places. This gave me an opportunity to explore the city differently. 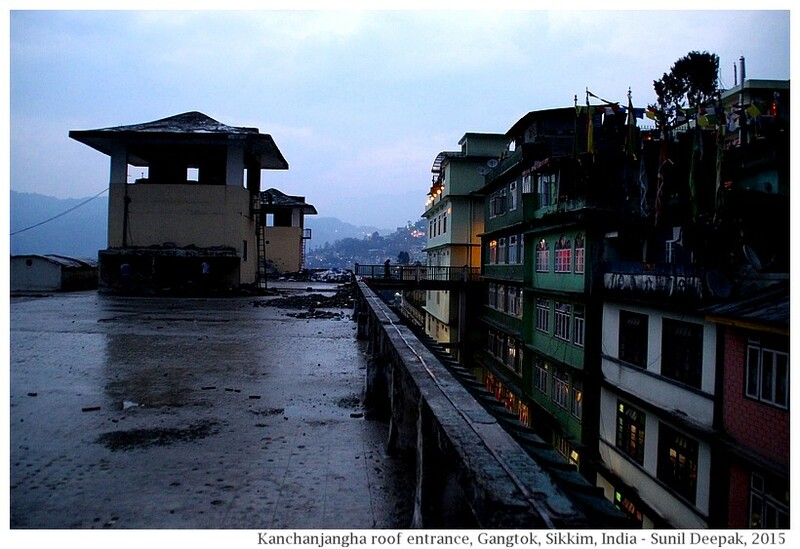 I think that I saw some parts of Gangtok that most tourists and visitors do not see. 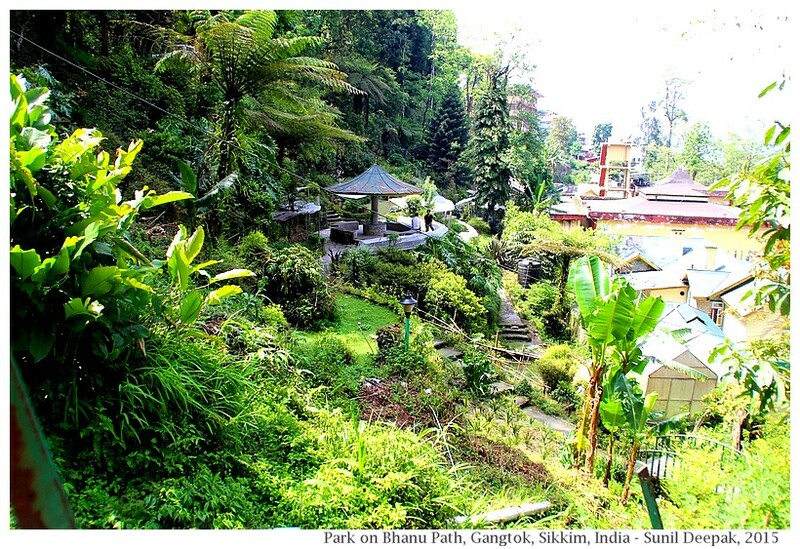 If you look at places that are advised in the guide books for the tourists visiting Gangtok – there are places like Tsomgo lake, Hanuman Tok, Nathula Pass, Ranka monastery, Ganesh Tok, Banjhakri falls, and so on. They are all outside Gangtok city. You are supposed to rent a vehicle to visit them or to join organized tours. I could not join an organized tour to visit the tourist places. So, I decided that for all my work appointments, wherever possible, I will walk. I also decided to use my mornings and evenings to explore as much of the city as I could. This photo-essay presents some of those beautiful places that I discovered! 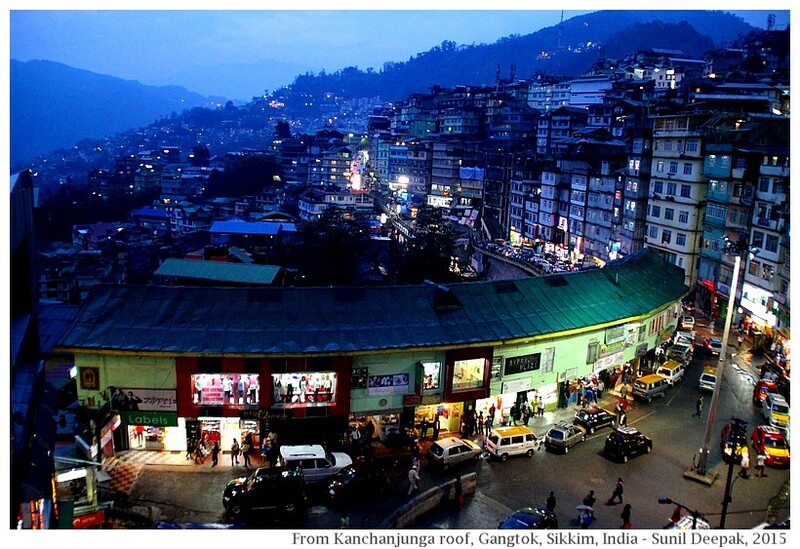 Gangtok is a small town. 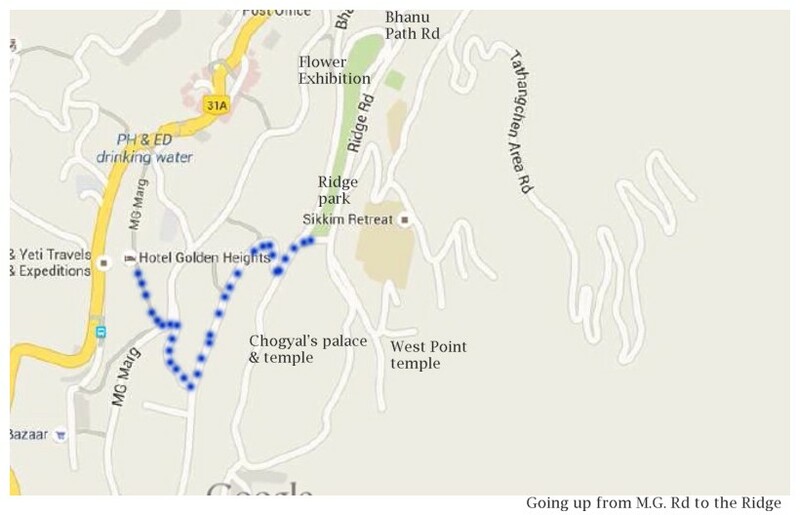 This first walking tour of Gangtok is around the central area of the city near the well known tourist tourist landmark, the M. G. Road. Going down from M. G. road, is the road to Deorali where the private sumo vehicles stop, when you reach Gangtok from the railway stations in Siliguri/New Jalpaiguri. This main road connecting Deorali to M. G. road is called Pani House road. This road continues after the Gangtok city as Baluakhani road. For this walking tour, I am going to focus on four roads – Pani House road is the lowest, M. G. road, and Sonam Gyatso road are in the middle, and finally at the top, there is the Ridge road. A lot of stairs interconnect these four roads. The map below shows some of the areas around Ridge described in this photo-essay. Check the Ridge area on Google maps for a better understanding of its layout. The distance of this walking tour is not so much - the whole walk should be around 4-5 km. However, it requires a lot of climbing and a lot of stairs. Thus, it may not be easy for children and for persons who are out of shape. It will also be a difficult tour for persons in wheel chairs, who will not be able to use the short-cuts through the stairs on the way down. Unfortunately, a lot of sidewalks of Gangtok are not wheel-chair friendly as they have lot of stairs. So if you are on a wheel chair, you will need to be on the side of the road - so make sure to wear some colour that is easily visible. And if your wheel chair is not motorized, you will need someone to help you with the climbs. 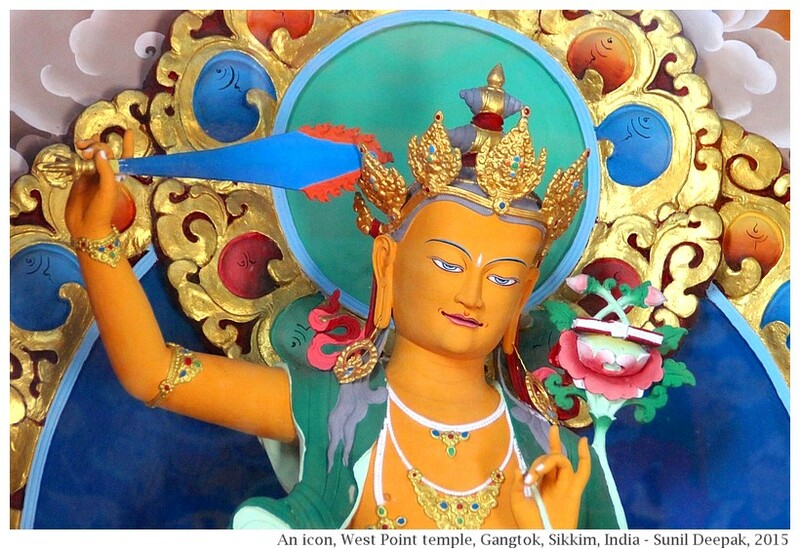 The walking tour starts from M. G. road, goes up the Sonam Gyatso road to top of the hill at the Ridge road. The return continues on to Bhanu Path road and ends at St. Thomas church on Pani House road. 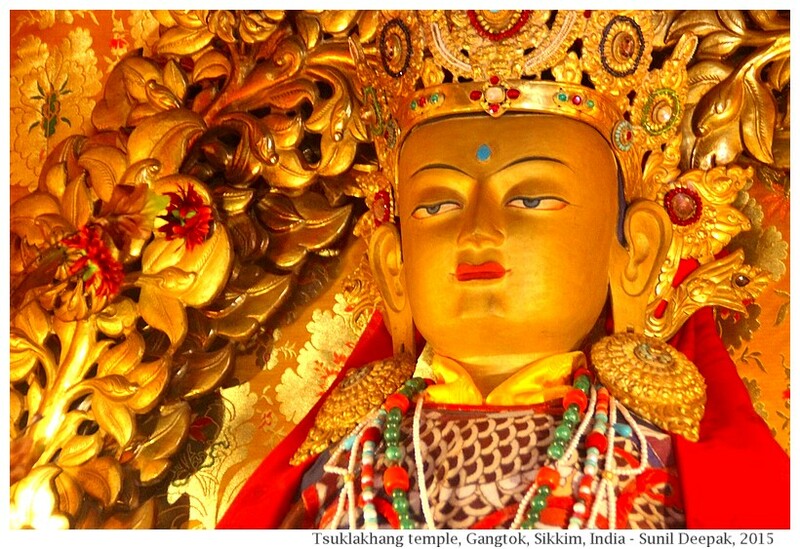 Important places to visit on this walking tour include Chogyal’s grand temple, Ridge park, West Point temple and Flower Exhibition centre. So lets start with M.G. Road. M. G. road is a wonderfully kept area for walking, sitting down, relaxing, having food and doing shopping. It has two statues of Mahatma Gandhi – a bust in a tiny park in the middle, and a complete statue of Mahatma with a walking stick (in the image above). At the other end of M. G. road (towards Deorali), you can look at the Assembly house and the station for cable-cars coming from Deorali. Earlier the cable cars used to go up to the secretariat near the Ridge. However when I visited Gangtok in May 2015, the upper part of the cable car was under repairs and was closed. The Cable car station in front of the Assembly building has a Chinese restaurant on the first floor. I didn’t try the food there, but the views from its terrace were absolutely wonderful (one view of the valley in the image below). M. G. road has a lot of stairs going down towards Pani House road. Some of them are very steep and long. Many have houses and terraces that open directly on the stairs. 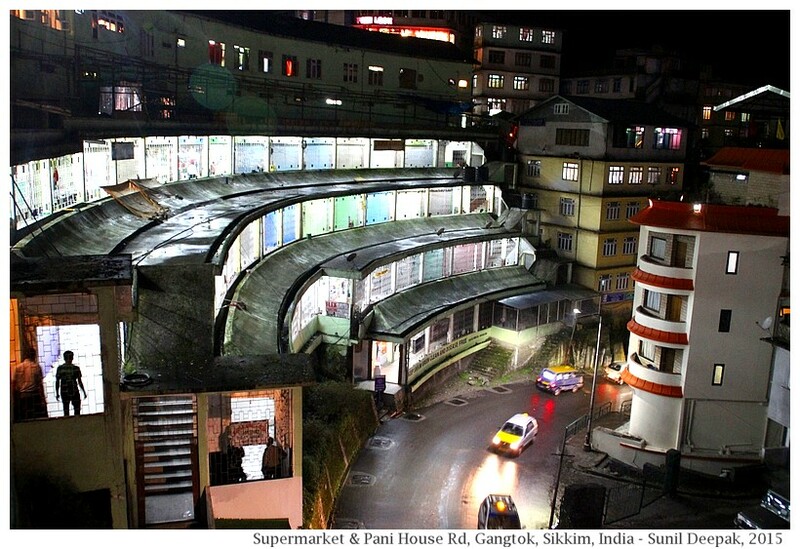 Connected to the stairs, there is a unique experience in Gangtok – entering a shopping centre through its roof-terrace. Near the "Khan Chacha's Biryani house", on the right hand side you will find two sets of stairs that take you down to a bridge leading to the roof of a huge building. This is Kanchanjanga shopping centre that has its main entrance near the Denzong cinema in Lal Bazar. On the roof, there are two covered entrances where you will find stairs that take you to the 5th floor of the shopping centre. It is a short cut often used by the locals. I had never thought about arriving in a shopping centre through the roof. The roof also provides you with wonderful views of the Supermarket building (in the two images below) in front of Denzong cinema. Supermarket is a little strange looking multi-story curved building, hugging the Pani House road below and Lal Bazar road above. Ridge is the highest point of Gangtok city. At the top it has the old Chogyal’s palace. 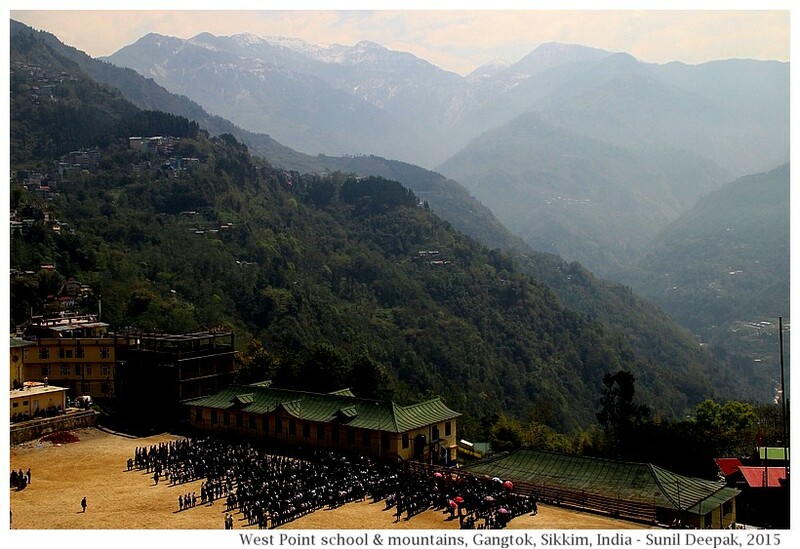 Chogyals were the rulers of Sikkim, before it joined India in May 1975. Just opposite the place where Lal Bazar stairs join the M. G. road, you can see the Sonam Gyatso road (old name Kazi road) going up. You can have some wonderful views of M. G. road as you walk up. After a few metres, take the right turn and keep on going up. At the top, turn left and continue walking up. 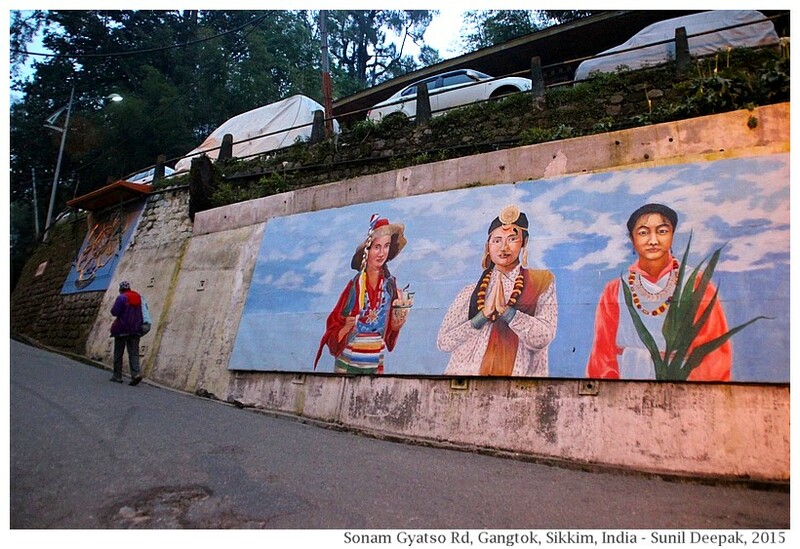 At one of the turnings on Gyatso road, I found a wall painting presenting some of the traditional dresses of Sikkim (Image below). The final part of the climb is a short but steep passage hugging the hill. On the right hand side, a road is marked as “Secretariat” and leads to the different offices of the state ministries and to the cable car station. I had gone there to visit Education Ministry. However, for this walking tour, please continue going up the final part of the climb to the Ridge. The total distance from M. G. road to the Ridge could be less 2 km, though it look me about 30 minutes to cover it (because I was often stopping to take pictures and to admire the view). At the top, on the right hand side an old run down traditional gate leads to the old Chogyal’s palace. The palace itself is closed to tourists and cannot be visited. However, you can enter the gate for visiting a temple. 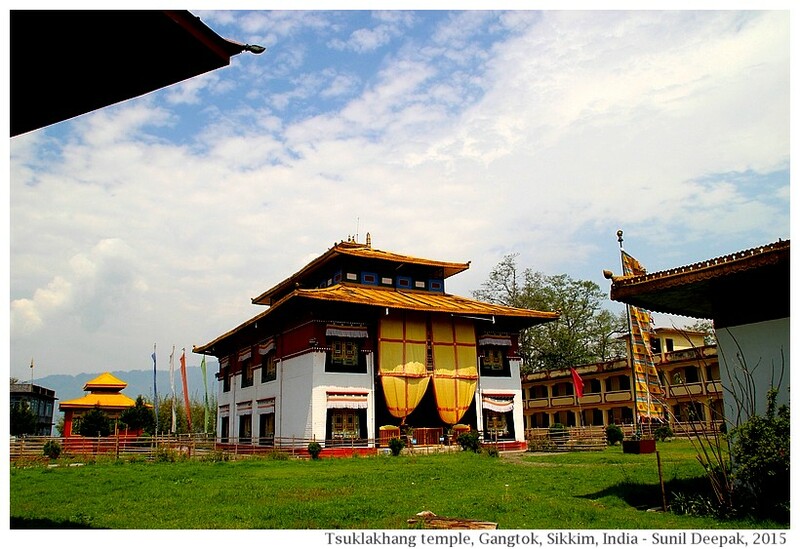 In the 1920s, Chogyal had built a big Buddhist temple (Tsuklakhang temple) and monastery next to his palace. This was the temple for the royals, and is open to public. It is a beautiful building and has been restored recently. The passage to the temple is lined with prayer flags in different colours. The temple includes a Buddhist school for children-monks and has some nice orchids in its park. It is a beautiful temple and is very well maintained. As you come out of the gate of Chogyal's palace, on your right you will see a valley. That is our next stop. Below in the valley you can see the West Point school. Behind the school, it is easy to see high snow covered mountains (West point school and the mountains in the image below). A little to the right, a small road leads to the village below, where there is a newly built Buddhist temple. If you do not mind going up and down, it is a nice temple to visit. It has the usual prayers drums outside on its walls. 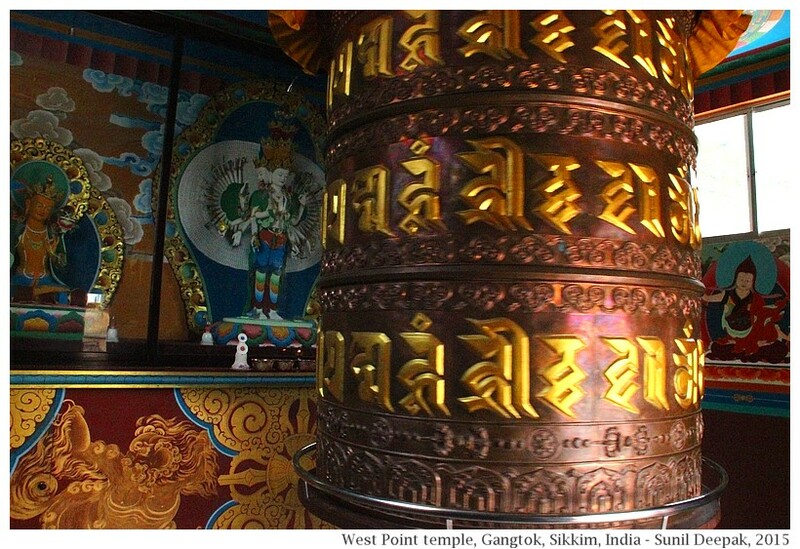 Inside, it has a huge prayer drum in its centre, that requires some effort to push. Across from the gate to Chogyal’s palace is the entry to the "Chogyal Palden Thondup Namgyal memorial park". It is a small but well maintained park with a central blue pagoda like structure. Across the Gangtok city below, on a clear day you can see the snow covered Kanchanjangha mountain. A small path leads from the park to the Flower Exhibition centre below. The Flower Centre also has a separate entry from the main road. 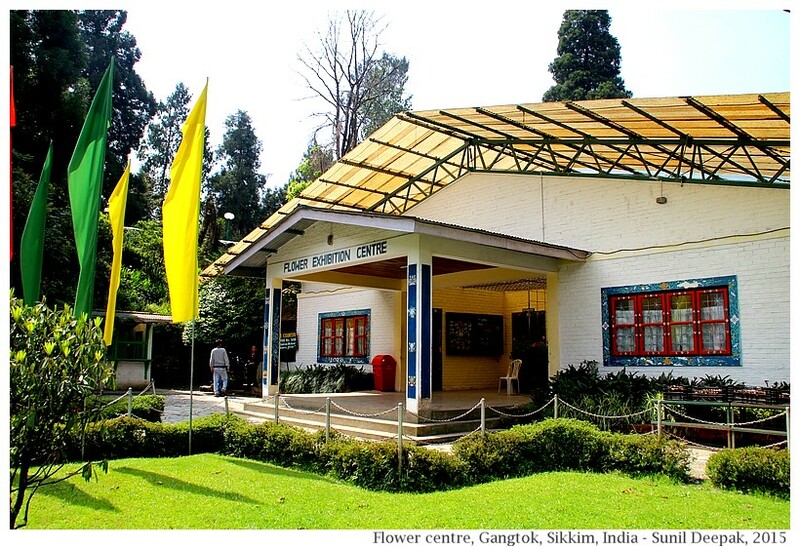 There is a small ticket for entry in the flower centre that has a nice collection of orchids and some other flowers from Sikkim. Most flowers are labelled. There is a small pond with a fountain and a bridge inside the centre. 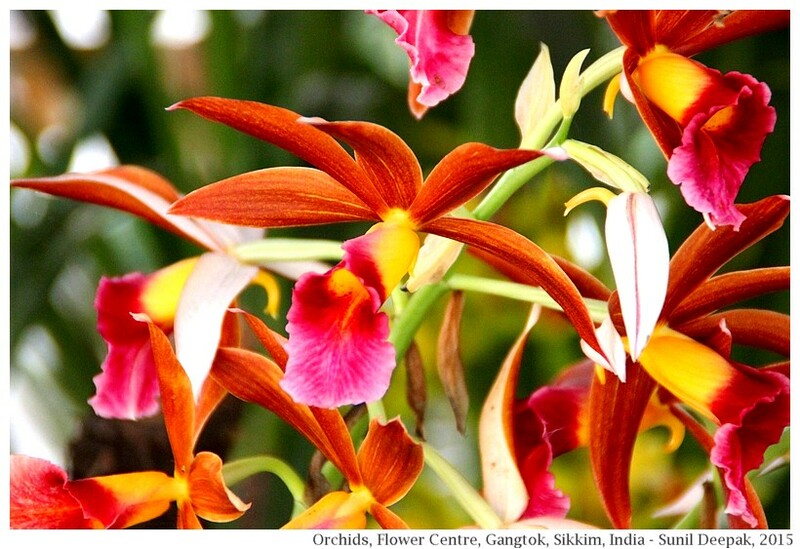 Orchids are common in the lower tropical part of Sikkim up to an altitude of about 2000 metres, though there are a few species that are found at 3000 metres and above. These are of two kinds – epiphyte and terrestrial. Epiphyte orchids are more common in Sikkim. 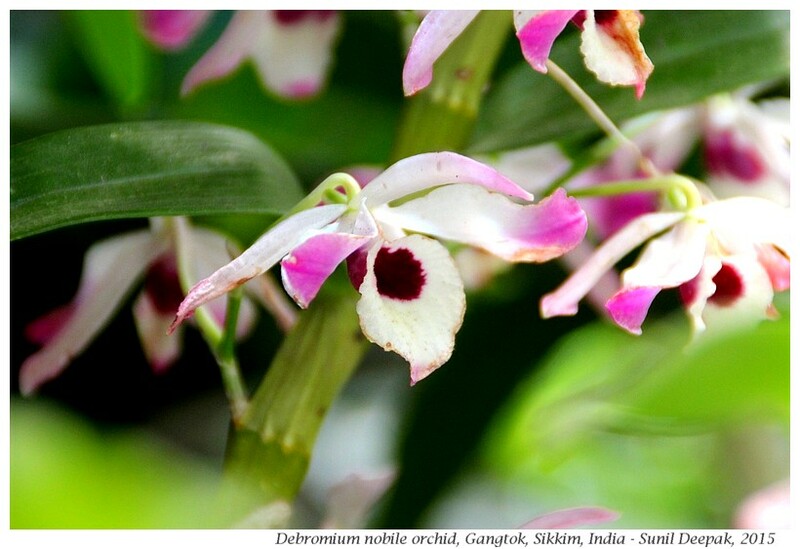 Some common epiphyte orchids in Sikkim include those belonging to genus Dendrombium - Cymbidium, Vanda, Phalaenopsis, Caelogyne, Arachnanthe and Saccolabium. (in the image below, a beautiful orchid from the flower centre). Dendrobium nobile orchid is the state flower of Sikkim (in the image below). Across the road from Flower centre is a two story white building, now used as a club, called White Memorial hall. John Claude White was a British civil engineer who was posted in Sikkim in 1888 as the political officer and who had retired in 1908. White built the British residency which is now used as the Raj Bhawan (house of the governor). 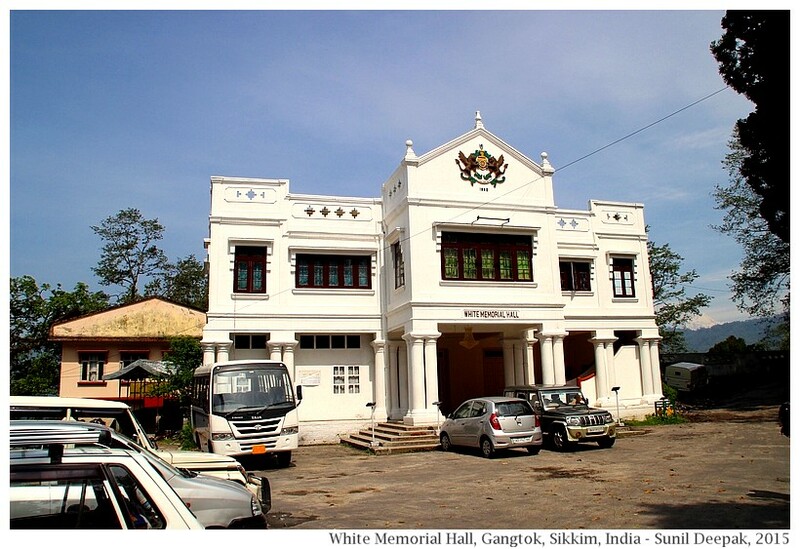 White Memorial hall was built under Chogyal Tashi Namgyal in 1930-32 to remember the contributions of John Claude White to Sikkim. This building is an example of British colonial architecture. The building has changing colourful light. 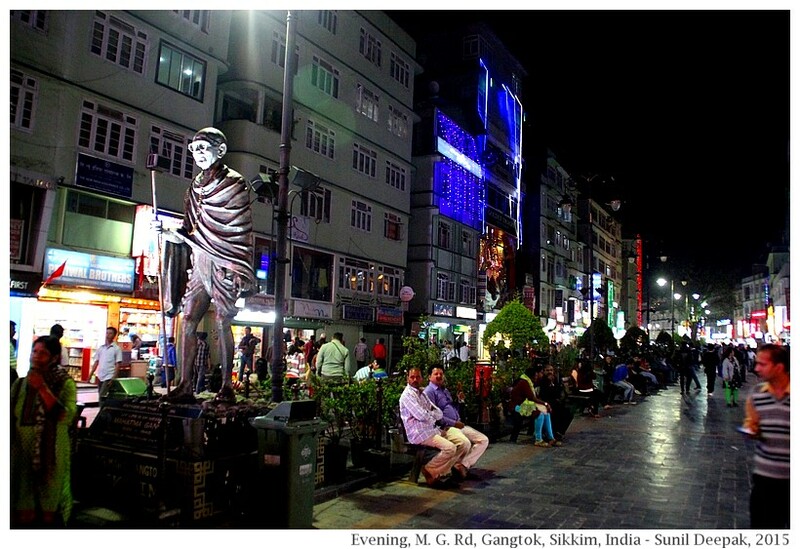 In the summer evenings, while throngs of young people of Gangtok sit around chatting and drinking tea or beer on the ridge, White Memorial makes a nice background. Continuing along the Ridge road, you will reach a roundabout, which has the statue of India’s first prime minister, Jawahar Lal Nehru. Nehru road from this round-about takes you towards Tsomgo lake and Nathula border. Take the road on the left, Bhanu Path road, going down towards Gangtok city. A little distance down this road, on the right, you will see a small road with a board, “Enchey monastery”. I am not sure how far is the monastery from this point - I did not try it. Going down the hill along Bhanu Path, take the stairs that allow you to reach down straight rather than going all around the road. Above the Prasar Bharati building, I found some stairs going down through a park. It was a small park with a lot of ups and downs, beautiful greenery, a couple of bridges and a small heart shaped pond with fishes. I rested in this park for some time, before continuing my journey down and coming out in front of St Thomas church on the main Pani House road. 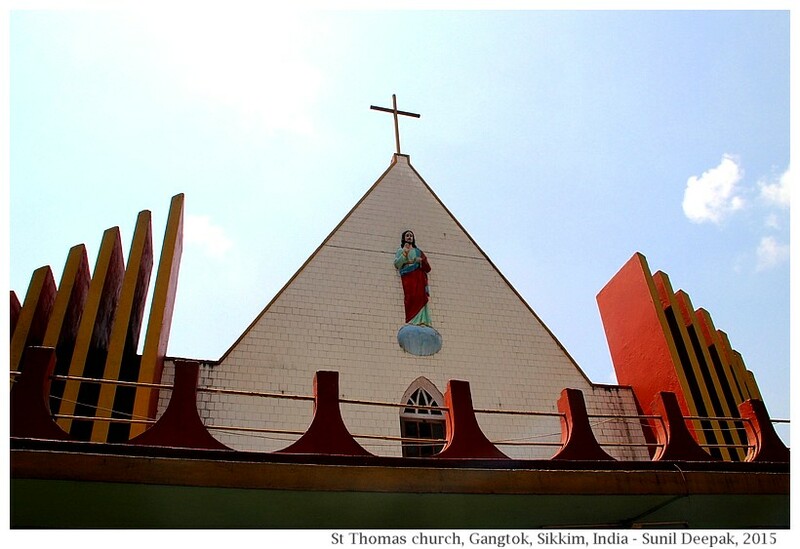 From the St. Thomas church, M. G. Road was a short walk away. I did not do this walking tour in one go. Rather I visited these places in bits and pieces. It was a very satisfying visit. 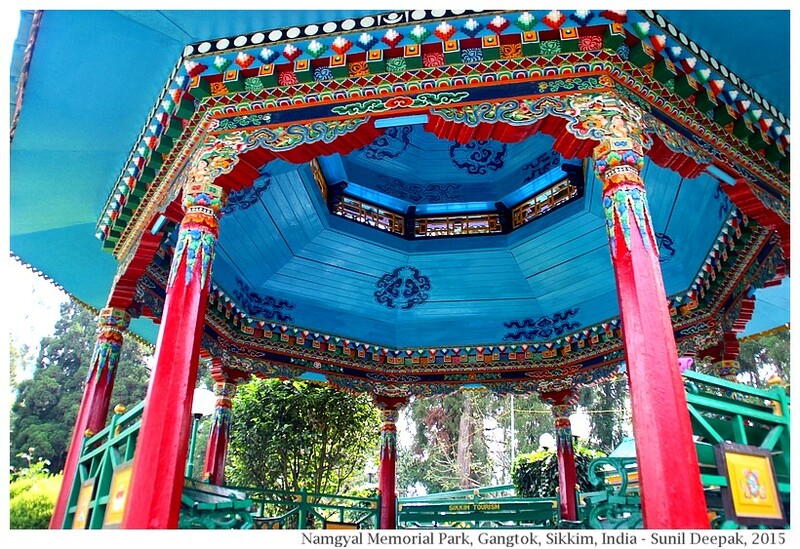 Perhaps there are other places in Gangtok which are seen as “local places”, though they have interesting stories behind them! If you know of such places that can be part of a walking tour, do let me know, and in my next trip, I will try to visit them. Before concluding I want to thank Mr. Harish Prasad from hotel Bayul on the M.G. road, who was very courteous. He gave me a room with the best view of the mountains around Gangtok. I had some very interesting discussions with him. For example, he told me that as a young man he had worked for some time in a leprosy hospital. As I have also worked as leprosy doctor for a large part of my life, I was very happy with this coincidence. I also want to thank Mr. Dhan B. Subba (introduced to me by my friend Cristina), who was very helpful. Finally, I am sorry that my meeting with Satish Bardewa from Yak & Yeti tours (introduced by my friend Sonia) did not work out - I look forward to meet him the next time. Wow! Memories refreshed. 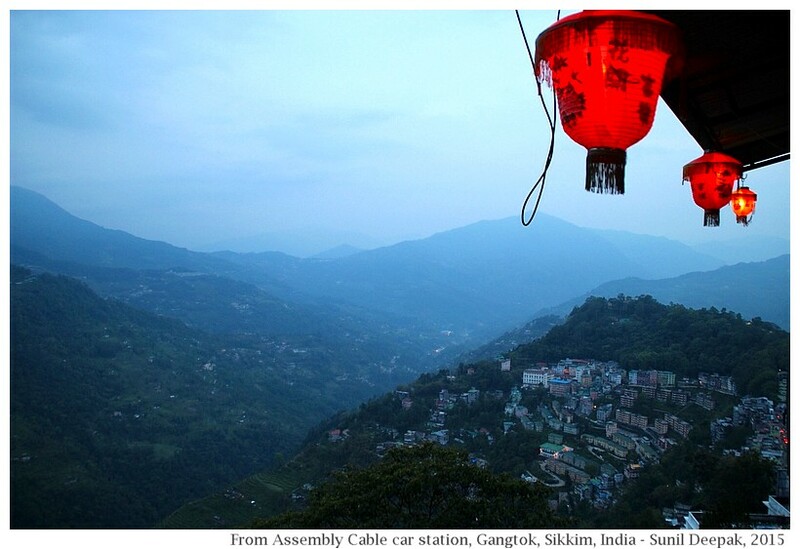 :-) Feel like flying down to Gangtok right now! what a beautiful town !! Thanks for the wonderful tour of Gangtok.. MG Road reminded me of Shimla, I think every hill station has a Ridge Road ;) I am fascinated about the Buddhist temples and Monasteries, all those temples look so vibrant and beautiful. Every hill station created by the British has a Mall road and a Ridge road and in that sense, I think that M. G. road can be comparable to Mall road in Simla. Only difference is that since M. G. road is closed to traffic, it is less chaotic. I have never been to Simla so I don't know about its Mall road. You can Book cheapest sikkim tour packages, top tour operators in sikkim and best travel agent in sikkim. In Gangtok, local Travel Agents help tourists and guide them about the place well and plan the Tour packages as per their requirements. 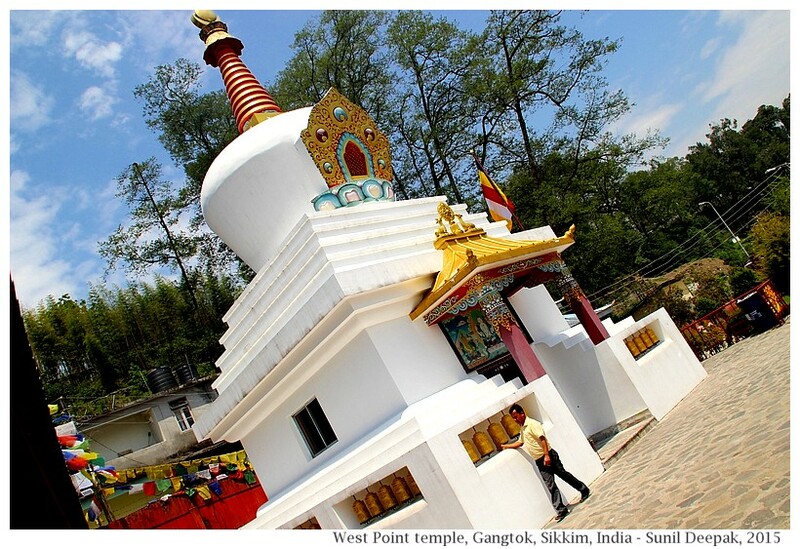 Avail the Holiday Tour packages of Gangtok. I acknowledge for this info.Thanks for sharing this blog.